Home » Black Friday Job Ads & Classifieds Sale! Black Friday Job Ads & Classifieds Sale! Black Friday Job Ads & Classifieds Sale! Its here!! 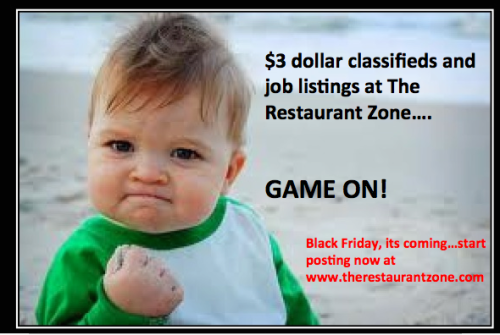 Hey there everyone, yes we are doing a Black Friday sale here at The Restaurant Zone. This our official Black Friday Job Ads & Classifieds Sale for 2014! 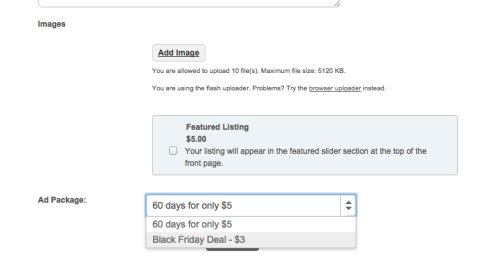 We are doing a Black Friday sale on our classifieds and job listings. Starting today and through Black Friday/Cyber Monday you can post on our site for just $3 (typically $10)…a 70% discount! Have a great holidays everyone, and let us know if you have any questions …as always more than happy to help!